twofold increase in overall lead volume. it wanted to reach children of Jewish mothers. "It's rare to find a new channel, that moves the needle to this extent. we think about reaching potential students on a grander scale." Firstly, we designed the 4 Buyer personas. We found the core pains of the target audience and wrote the content on the website on that basis. The understanding of the clients wants and pains help us to create the promotion (multichannel) strategy and UI/UX mock-up for the web development. STL wanted to get the most out of the market share available on the Internet. With the help of advertising for the avatars, it was possible to increase the number of quality leads and attract new students. In this case, a simple advertisement with image and text was used. 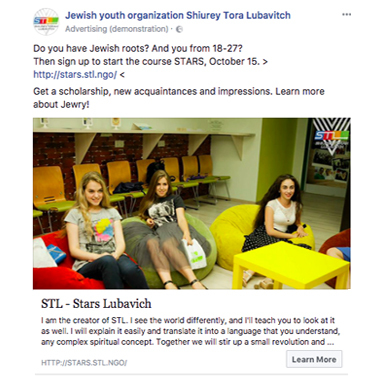 For example, photos of usual lessons were paired with text promoting to take part in the educational course, and on the desktop image, there was an inscription "Do you have the Jewish roots? When you clicked the "More Details" button, a context card was opened with information about what is included in the program (for example, individual lessons and access to a huge resource library) or the website. Advertising invited people to indicate their email. address for more information about the program. "